A new genre of high performance SUVs is being birthed right before our eyes. There’s a horsepower war going on among Germany’s luxury SUV builders as of late and thanks to demanding customers with inflated wallets, the rest of the world’s SUVs will soon join suite. Before the almighty Lamborghini Urus makes production, we can expect to see the Alfa Romeo Stelvio Quadrifoglio featuring the same 505 horsepower engine as the Giulia alongside souped-up versions of the Range Rover Sport, both of which will render the 380 horsepower F-Pace S as the slowpoke of the SUV world. We’ve heard about the automaker’s remedy, the F-Pace SVR, for quite some time but thanks to our spy photographers’ quick shutter fingers, we now can get a closer look at the F-Pace SVR in the metal. Caught undergoing hot weather testing in Spain, we’ve managed to catch subtle differences underneath the heavy camouflage, where we can see a new front bumper with what appear to be slightly larger intakes and a revised exhaust system with four ports to let its engine breathe. According to our photographers, the clear differentiator between this Jag and the standard F-Pace was the exhaust note, which we’re sure sounds as vicious given the automaker’s reputation for drama. 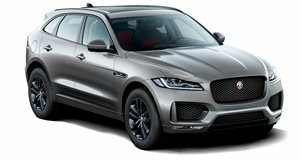 While it’s still too early to tell, it doesn’t look like Jaguar did much to differentiate the SVR model from the standard F-Pace although this may help it be a factory-ready sleeper. Like Alfa Romeo did with the Stelvio QV, we hope that Jaguar offers black rims paired with flashy brake calipers and large carbon ceramic brakes to help it stand out. Just as unclear as the design is Jaguar’s engine choice, but choice is something the automaker is spoiled for given that it has the 575 horsepower 5.0-liter supercharged V8 that lives in the F-Type SVR or a highly tuned version of one of the automaker’s V6 models churning out horsepower figures in the neighborhood of 500. As always, our fingers are crossed for whichever option delivers more power.